This is my newest book cover illustration for the novel Sentinel by Melanie Jordaan (title may be subject to change). I was given several pages worth of scenes featuring various characters, locations and magic concepts. One of the difficulties I had was trying to fit as many of the important features into the illustration as possible, but I knew it had to focus on the Sapphire sentinel (the protagonist). A few scenes were discarded as being too dark for the tone of the book cover (i.e. great imagery, but not fully indicative of the novel itself), or too complex (i.e. too many competing features/ characters). The city is set on the top of a mountain, contains a crystal wrapped map room, and the background has an impossibly large landscape of a moat-like river and mountains in the distance. This almost became a secondary character to Sapphire. These were the initial sketches I sent through. Most of the action has to be on the far right, where the front cover is. The left side should be fairly empty to allow for the blurb. 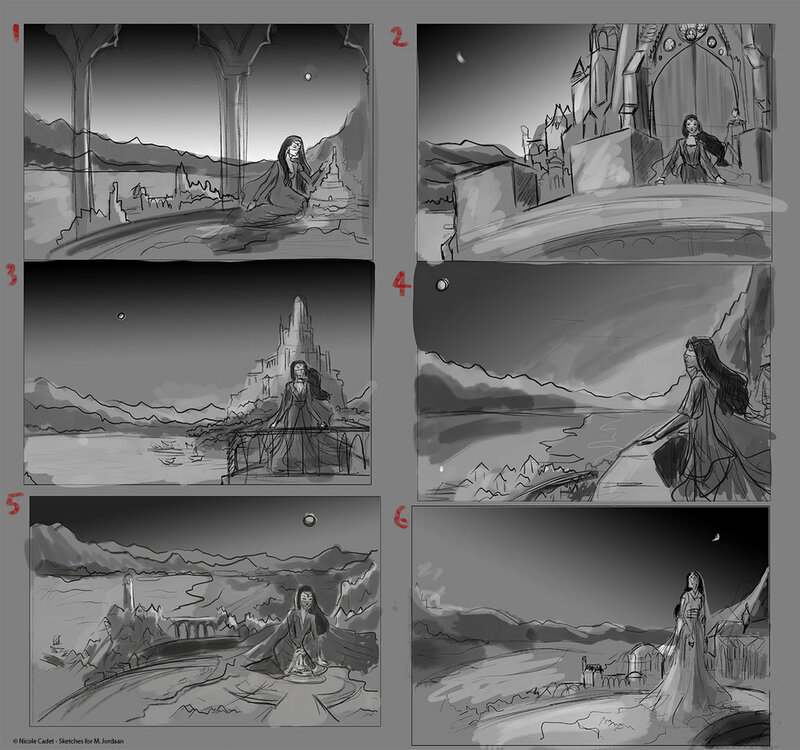 I sent through the sketch based on option 6 as chosen by the client. The scene was one where Sapphire is looking back, watching as night changes into day. It's kind of a metaphor for the internal battle between light and dark the character goes through. I wanted the blue of her dress to pop, which is why I wanted the background to be oranges and pinks. 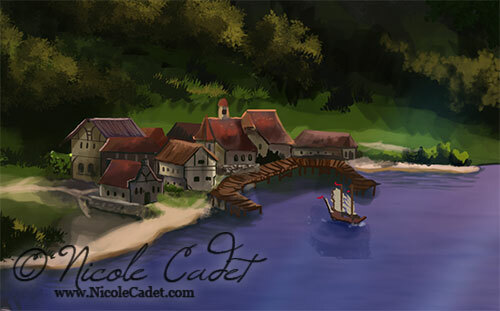 There were some final adjustments to the sketch which included some villages along the shoreline, removing the staircase and moving the moon. The client sent through a detailed description of the map for the floor. Colour concept number 1 was what was decided on. Her costume needed to be head to toe, with a veil covering her lower face. Although the architecture is more European gothic, I combined elements of Chinese garb and simple cotehardie of European style. The fabric is meant to magically flow as though touched by air. There's also very little decoration. The glass/crystal went through a few rounds of edits. This version I toned down as the ebook version looked quite pale. I'm not sure what version the client will go with. This is the approved final image. The background is toned down a bit because the crystal/ glass is more opaque.